I felt inspired to explain more about a favorite topic of mine. If you have ever read any of my pieces, you may have noticed that I occasionally write about the Moon's Out of Bounds transit. The best way I know how to explain this event is to show you what I am talking about. Let me start by explaining the concept of Declinations and then move on to the meaning of Out of Bounds. Every year, during the Equinox periods, the general view from the Sun to the Earth is centered over the Equator or 0° latitude on Earth. The image (Fig. 1) represents a perspective that we would have of the Earth if we hovered high enough above to see the continents while lined up with the Sun's rays at each Equinox. The Earth is performing three feats simultaneously. The Earth spins (like a top on its axis) AND circles around the Sun, PLUS it performs a seasonal tilt. The tilt is the action we will focus on at the moment. The tilting of the Earth is used to create the equatorial coordinate system (a fancy term that defines the way the planets are measured based on their angle to the Earth). But let's keep this discussion light and simple. The Earth's tilt allows to Sun to have equal time to alternatively visit the Northern and Southern Hemispheres during the Summer and Winter seasons. Thus, the Equator receives the most time with the Sun's direct rays while the Earth gradually tilts from the Northern view to the Southern view, and back again. The seasons of Spring (Vernal) and Fall (Autumnal) are the two Equinox points. The Equinoxes are generally on the 20th or 21st day in March and also on the 22nd or 23rd day in September. The Sun's journey, via the Earth's tilt, above and below the Equator's belt is what provides the Winter and Summer seasons for those of us living well above and below the Equator. The maximum points of the Sun's path are also what constitutes the two imaginary lines of "Tropic." The examples in this piece are of the Western Hemisphere for simplicity purposes. The Equator and the two lines of Tropic do extend around the entire Earth at their respective latitudes. The seasonal events occur during the same time frames listed in the Eastern and Western Hemispheres and are dependant upon Northern or Southern locations. The Northern Hemisphere's lean towards the Sun reveals the Tropic of Cancer. In Fig. 2, we see the imaginary line where the Sun's direct rays are focused during the Northern Hemisphere's Summer Solstice near June 21st. Just like the Equator, the Tropic of Cancer completely encircles the globe. At 23.5° latitude, this becomes the most Northern point to which the Sun's rays are allowed to shine directly on the Earth. More precisely, the Sun's direct rays peak at 23°27'. While the Earth tilts in this direction, the Southern Hemisphere is experiencing Winter. The Sun's direct rays only last a few days at this point before the Earth's most extreme Northern tilt gradually relaxes during the next three months back to the center. By late September, the tilt is gone, and the Earth is receiving the Sun's rays over the Equator once again. Now it will be the Southern Hemisphere's turn to lean towards the Sun and receive the Summer Kisses of light. Similar to the Northern Hemisphere's Summer, the Southern Hemisphere begins to experience longer days of sunlight and shorter nights of darkness. To look at the view of the Earth in Fig. 3 to the right, the image seemingly thrusts the Northern Hemisphere to the top of the Earth. The Southern Hemisphere moves into the spotlight allowing the Sun's direct rays to meet up with the Tropic of Capricorn near the 21st of December. We begin to comprehend that the Sun does not create the seasons for us. Instead it is the Earth's transitional tilt that slowly undulates to the north and then to the south to allow equal time for growth and expansion to as many areas of the Earth is it can realistically provide. The two lines of Tropic are positioned at 23.5° latitude above and below the Earth's Equator. Hence, the Tropic of Cancer is 23.5° North while the Tropic of Capricorn is 23.5° South. Now, anyone who studies Astrology already has a fairly good grasp of the seasons based on the relationship of the Earth's tilt back and forth as it revolves around the Sun. We comprehend that, for the people living in the Northern Hemispheres, the Summer Solstice occurs as the Sun is directly overhead the Tropic of Cancer line near June 21st just as the Sun ingresses the sign of Cancer. We also comprehend that the Winter Solstice occurs as the Sun is directly overhead the Tropic of Capricorn line near December 21st just as the Sun ingresses the sign of Capricorn. The yellow highlights of the areas north and south of the Equator in Fig. 4 provides a visualization of the general area that gets the most direct exposure to the Sun based on the Earth's tilt. The bright yellow line represents the Equator at 0°. Finally, we begin to comprehend how the concept of declinations comes into play with Astrology. The path of the planets by angle and latitude is called declination. More concisely, any celestial object's transit can be measured by declinations, which in a nutshell, correspond to the lines of latitude of the Earth. The works of the late, great Declinations Lady, Kt. Boeher (pronounced Kay Tee) helped me to further understand that the Sun's path by declination corresponds to the Sun's movement through the degrees of the zodiac signs. The Sun's path is used to define the standard path for the other planets as well. Since we look at the Sun, Moon, or any of the celestial satellites of the Sun, based on our earthly perspective, then Earth is where the declination measurements originate from as latitudes. Several of the planets deviate from the Solar declination path. While the Sun will go no farther than the Earth will tilt in relation to the Sun, the other planets have the ability to be nonconformist by surpassing those lines of Tropic. The term used to describe this phenomenon is "Out of Bounds." Just like the rules for many games or sports involving balls; when the ball goes out of bounds, there will usually be a repercussion. The standard astrology rules are also breached when planets transit Out of Bounds. The Out of Bounds transits have a different impact on the game of life. We see the difference, but do not always comprehend it because we may not be aware that a planet has actually transited Out of Bounds when we only use the basic longitude measurements that Astrology heavily relies on. It is time to turn our focus onto the Moon. The Moon is renowned for crossing the Out of Bounds line the most. Below, Fig. 5 and Fig. 6 reveal approximately how far the Moon is capable of exceeding the Tropic lines. The dotted yellow lines approximate the Tropic lines and the dotted blue lines are the declination that the Moon is capable of reaching beyond the Tropic. The light yellow line in the image above is the Tropic of Cancer. The blue line is the Moon's potential Out of Bounds declination. The light yellow line in the image below is the Tropic of Capricorn. The blue line is the Moon's potential Out of Bounds declination. The next image is a flat representation of the world. 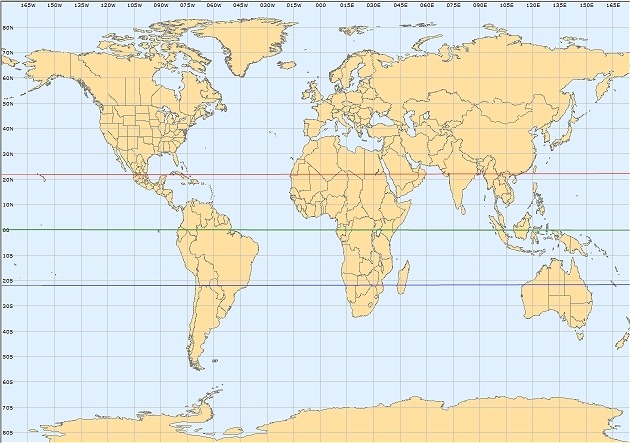 The Green horizontal line is where the Equator is. The Red Line north of the equator would be the approximate location of the Tropic of Cancer. The Blue Line south of the equator would be the approximatel location of the Tropic of Cancer. When planets move beyond the blue or red lines they are considered to be Out of Bounds or in extreme declinations. There are a variety of graphs available to demonstrate the Sun's declination path. Many individuals rely on a graph that looks more like an open "Egyptian eye" to demonstrate the path by declination relative to the longitudes of the zodiac signs. I prefer the more dramatic image of the chart below that I created to represent the complete cycle of the Sun's 360 degrees through the 12 signs as well as the 47° declination tilt of the Earth in relation to the Sun. Doesn't that look just like a huge kiss ? Okay, I concede. In truth, it does look more like a strange nut! Another type of chart uses the calendar. The linear Calendar Year looks substantially different as revealed with a chart like the one below. The numbers in the left hand axis represent the declinations/latitudes. The Equator is 0°, the Tropic of Cancer is 23.5° and the Tropic of Capricorn is -23.5°. This chart corresponds with the Sun's declination path for the entire year of 2005. Are you overwhelmed yet? I hope not, since there is so much more for me to explain. Let me throw the same chart at you with a bit more information to hopefully begin to make everything I've said up to now, a bit more clear. Let's add in the Moon's declination path for 2005. You immediately see that Moon's cycle through the declinations is almost thirteen times faster than the Sun plus, in 2005, it substantially exceeded the Sun's declination path both to the North and the South. Next, you are likely to ask, "Can we do this with any other planets?" Yes, the next chart (below) is the Sun, Mercury, Venus and Mars declination chart for 2005. You will immediately notice the erratic "up and down" movement of the dark blue line representing Mercury. These short term dips correlate to Mercury's retrograde motion and return to direct motion. You also notice that in January, all the planets essentially began near the same point signifying that they were all close together from the Earth's vantage point and the zodiac. Mercury, Venus and Mars were in the sign of Sagittarius and the Sun was in Capricorn. In the month of January, the declination paths of Mercury (blue) and Venus (purple) both dropped slightly past the Tropic of Capricorn although they did not exceed it by very much. while Mars (red) was a little slower to arrive at the Southern Tropic line and, once there, lingered a little longer in February. We also notice that Mercury and Venus seem to stay close to the Sun's declination path since they never stray too far from the Sun by zodiac sign either. As the year wore on into Summer (Winter for the Southern Hemisphere), both Venus and Mercury exceeded the Sun's declination path once again only it was the Northern Tropic of Cancer. This time, they hit the boundary harder with Mercury maxing out at 25°15'N while Venus made it to 25°25'N in June. Near the end of the year, Venus totally took the Out of Bounds plunge in October and November. Venus made it all the way to 27°06'S. Mercury did a smaller double dip in November to 24°33'S and again in January, 2006 to 24°15'S. Let's not ignore Mars. The perennial rogue took off on his own as he settled into a retrograde motion and hung out in the Northern Hemisphere for months near the end of 2005. Once I was able to see how the planets moved over the declinations, I began to see a whole new level of planetary cycles that I had missed before I knew about declinations. The added dimension exposes a different flavor to the planets that is not so obvious when using standard astrology. The transitions became easier for me to understand and explain to others who feel the tension when the planets travel Out of Bounds. Granted, not all the planets travel Out of Bounds. Let's quickly run down the list of which planets can, and cannot transit Out of Bounds. Of course, the Sun can never travel Out of Bounds since it "sets the standard" in relation with the Earth. More correctly, the Earth sets the Sun's standard declination path. The Earth, however, has little control over the other planets in their declination paths. The Moon, Mercury, Venus and Mars appear to go Out of Bounds the most. On occasion, Jupiter will travel Out of Bounds, but it is a rare occasion. Saturn does not appear to have been Out of Bounds at all in the past five hundred years. Also, Neptune does not appear to have any recent Out of Bounds ventures. Uranus and Pluto typically make long extended Out of Bounds journeys every so often. However, the degrees of the Pluto and Neptune trips are seldom in excess. I have not checked the declinations for the major asteroids and my initial research of the planetoid Chiron over the past 100 years did not reveal any Out of Bounds events. One observation regarding the Moon's declination path. Although the Moon can exceed the Sun's declination path with the most extreme Out of Bounds transits, these extreme declinations only transpire during specific time periods. The Moon's extreme declinations transits are easily tracked by the positions of the Lunar Nodes. Conversely, the Moon's cycles can peak well short of the Sun's declination path during certain periods. The most extreme declination periods coincide with the timing of the Moon's Major Standstills. Then, approximately 8.5 years later, the Moon's most minimal declination periods coincide with the Moon's Minor Standstills. Take a look at the mini charts below for a better explanation. Although the charts above are not as clear because they are smaller and cover longer time spans, we can still see the Sun's path (green) over a span of three to four years in relation to the Moon's path (light blue). The black line represents the Lunar North Node . Remembering that the Node is not a planet or a satellite, but instead is a mathematical point based on the Sun and the Moon. In the chart on the left, I included a dotted red vertical line in the middle of the chart to show where the North Node crosses the Equator. The Moon's declination cycles coincide with the 19-year cycle of the Lunar Nodes. The left hand chart reveals that the Moon never went Out of Bounds during that entire four-year period (1920-1924). As the North Node crossed the Equator in August 1922, it was moving from Libra into Virgo by perpetual retrograde motion. The chart on the right above reflects a different period of time when the Lunar North Node was meeting up with the Sun's path at the Tropic of Cancer in 2001 (as the Node was preparing to leave Cancer into Gemini) the Moon's declination path also began to match the Sun's declination and gradually exceeded the Sun's path a little more with each lunar cycle. In the span of three years, the Moon's declination peak expands from approximately 21º to approximately 26º each month. The Moon can only travel beyond the Sun's declination path while the Lunar North Node is in the signs of Gemini, Taurus, Aries, Pisces, Aquarius and Capricorn (with some exceptions near the fringes of Cancer 0° and Sagittarius 29°). The Moon will always be in the most extreme Out of Bounds declination transit while the Lunar North Node is moving from Aries into Pisces. The Moon's most minimal declination transits (less than 18° North and 18° South) occur while the Lunar North Node is moving from Libra to Virgo. The Lunar North Node factor only applies to the Moon's declination transits and does not appear to be related to the other planets' Out of Bounds events. An individual can easily tell when the Moon is likely to travel Out of Bounds by looking at the transits of the Lunar North Node. But to save you some time and effort, I'm listing the approximate time periods in the past 100 years when the Moon was capable of exceeding the Out of Bounds declination: 1908-1917, 1927-1936, 1946-1955, 1964-1973, 1983-1992, 2001-2010 and 2020-2029. If you are born within one of these time periods, and your Moon sign at birth was Gemini, Cancer, Sagittarius or Capricorn, then there is a strong possibility that your Moon's declination may have been Out of Bounds. Declinations are the equatorial positions based on the Earth's seasonal tilt in relation to the Sun's rays. The Sun's current maximum declinations are located near the Tropic of Cancer 23°27'N and Tropic of Capricorn 23°27'S by latitude. The Sun can never travel Out of Bounds by declination. Saturn and Neptune do not appear to go Out of Bounds. As an additional note, the planetoid Chiron may not go Out of Bounds either. I have not checked all the asteroids. *2011 Note: I have learned that the asteroids Ceres, Pallas and Vesta do travel Out of Bounds regularly every few years for months at a time, but these transits are definitely not like clockwork and can miss the mark all together in any given cycle, particularly Pallas and Vesta. Most of the planets can only be Out of Bounds while transiting in the signs of Gemini, Cancer, Sagittarius and Capricorn. Pluto is the exception with the ability to be Out of Bounds in Leo and Aquarius. The Moon can only cycle Out of Bounds when the Lunar North Node is moving through the signs of Gemini, Taurus, Aries, Pisces. Aquarius, and Capricorn . While the Lunar North Node is in Scorpio, Libra and Virgo, the Moon will always fall extremely short of reaching the Sun's declination path. During the transition of the Lunar North Node from Aries to Pisces, the Moon will reach its most extreme Out of Bounds positions with peaks exceeding 28° North and South. * Charts were created using Kepler 7.0 astrology software and Earth's images were created using Astrolog 5.40 software. ** Many thanks to Leigh Westin and Helen Adams Garrett for their contributions to this subject and their inspiration to document the research. While much of their work was way over my head in the beginning, it gradually sunk in and made sense. © 2006 & 2011, J McCaul, Lunar Living Astrology - No portion of this article may be reproduced in any media source without written permission from the author. All planetary information on Lunar Living is based on Tropical computations (aka Western Astrology).